Account Name – PROVIDE CARS LTD. Please note that if you are a customer of Provide Cars, you will have your own unique Account Identification Number (Dealer Number). If you have made funds transaction to our company in the past, your previous account number with Sumitomo Mitsui Banking Corporation will be your “Dealer Number” (starting with 7390xxx). Since we are receiving multiple international transfers every day, it is easier for us to have this “Dealer Number” to attribute payments received to the right customer quickly. If you are not sure of your account number, please contact a customer service person. Please follow below procedure to make your funds transfer. -If you are already our member… Please put Dealer Number along with the name of sender. Important!!! Please note if we do not have your Dealer Number indicated to the funds transaction information, then we will not be able to identify your funds. Please do not forget to include your Dealer Number. -If you are a new customer… If you are sending a deposit to our account, please identify yourself “Deposit from YOUR NAME” when you make a funds transfer. Our customer service person will inform you of your unique Dealer Number affter we confirm your deposit. If you have any questions, please contact a customer service person. Can I have an immediate log in to view the auctions? You certainly can. Go to this page and within a few minutes you can view the Japanese used car auctions. Can I as an individual, not a dealer, buy through you? You certainly can. Our sales staff Les Brimblecombe will guide you through the whole process. When can I start purchasing, I saw a car that I want to purchase today? As soon as your 100% returnable deposit has arrived in our bank account in Japan, then we can give you bidding rights. You have filled out the application form here haven’t you? I have sent my deposit, when can I bid? As soon as your deposit has arrived in our bank account in Japan, then we can give you bidding rights. I want to become a full member, where is the application form? What are the basics of an auction sheet? 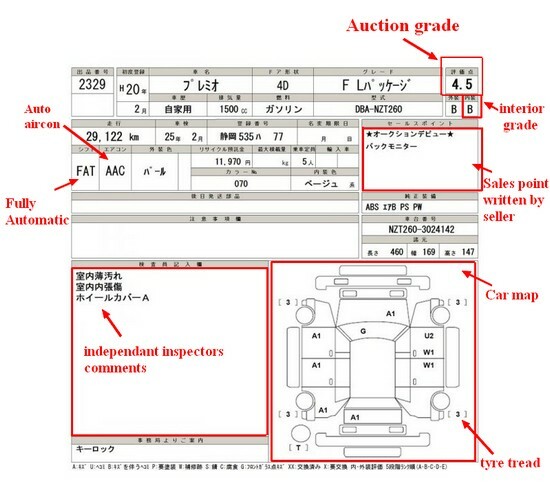 Auction sheet styles differ between auction and have digital and analogue (picture) formats.Here is a typical picture format auction sheet.These are inspections done by the auction independent of the seller.If you look at the car map below you will see two bottom boxes.These are the independent report done by the inspector employed by the auction. Does the information on an auction sheet ever change before the car is sold? Yes, occasionally it does.This in Japanese is called a “teisei” or a “correction”.Sometimes the correction is something extremely minor such as “do a name ownership change within 2 months please” and sometimes it is major like “changed from a grade 4 to grade R, right front inside panel replaced”.In the first case, we would ignore the correction and bid on the vehicle for you.In the second case, if we could not contact you and confirm whether you still want to bid on this vehicle,we would not bid on the vehicle for you. 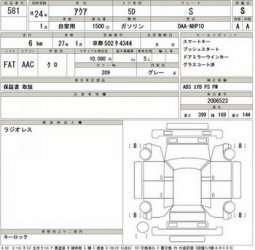 What information can I get about the car before looking at the auction sheet? 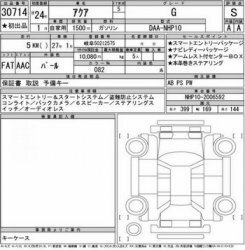 For example, the top car in this result list for the Toyota Aqua (that does up to 40kms/liter) shows the date of the auction.The auction name (JU Saitama), the maker (Toyota), car name (Aqua), grade (S), year (2012), colour (black), cc (1500), transmission type (Fully Automatic), fuel type (Petrol), condition (9 or brand new), equipment codes (AC, ps, pw, abs, srs), start price (1,180,000yen), and the most likely time for the car to be sold (14.28pm). For example, in the above map details given as follows: auction date, auction name, maker, model, chassis type (for skilled dealers), year, kms, colour, engine size (CC), transmission type, fuel type, auction grading, start price, result time. I don’t understand any Japanese, how am I supposed to read the auction sheet? We don’t expect you to understand Japanese OR an auction sheet. We translate every vehicle for you before purchase and will only purchase when we are sure you understand and are happy with the translation. Not all the auction sheets are the same are they? No they are not unfortunately. Have a look at the different auction sheets below for the same type of brand new car selling in the auctions. Typed and digital auction sheets are easy to read. USS hand written auction sheets unfortunately are not always easy to read. Am I bidding live on the auction myself? There is a serious correction on the auction sheet about the vehicle from the auction. Unless we get your feedback about the auction sheet correction, we will not bid on the vehicle. Again, this applies to serious corrections, not minor corrections. Your account is not up to date according to the contract of the Terms of Trade. 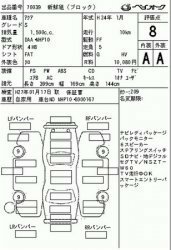 If I put a bid on a car and there are faults written in Japanese on the auction sheet, what should I do? Provide Cars will never bid on a vehicle unless it is happy that the customer knows the condition of the vehicle that is being bid on.For this reason Provide Cars provides a translation service, to informs its customers of the condition of the vehicle so the customer can make the decision on the quality of the vehicle. When will I know that I have bought a vehicle or not? Provide Cars will let you know on the day of purchase. You will see this following sign when you have bought a car. No, we do not allow payments by installments. Can I pay by credit card or cheque? No, we do not accept payment by credit card or cheque. You can do payment by TT. How will I ship my vehicle? Do you do the shipping? Provide Cars takes care of all the shipping, it is part of the whole process. When will my car be shipped? Your car will be shipped as soon as the documentation is cleared, AND, 50% FOB or CIF payment has been confirmed, AND, a ship is available. What shipping line will you use? We use any and all shipping lines. If you have a preferred shipping line, tell us, and we will use that shipping line for you.